Design and technology pupils at a Harborough school had the opportunity to see how skills taught in the classroom can be put into practice in the world of work thanks to the donation of a site model from Barratt Homes. The leading homebuilder has given the site model of phase one at its Farndon Fields development, in Harborough, to Welland Park Academy to help Year 7 pupils in their learning and inspire them to consider careers in the construction industry. Year 7 have recently been studying Computer Aided Design (CAD) and have used software to produce their own 3D models of homes. Class teacher Rhys Roberts said the site model will be extremely beneficial to the pupils. Farndon Fields site manager Gavin Coleman visited students to deliver the model and see how it would be put to use. He said: “It’s nice to see the site model go to such good use. 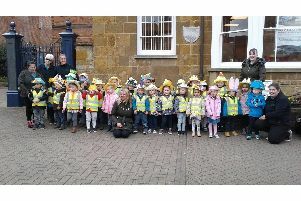 Andrew Swindell, managing director of Barratt Homes Northampton, said: “As a company we endeavour to give as much back to the communities at our developments as possible. Farndon Fields is a short walk from the Harborough. Offering a broad choice of three and four bedroom homes, as well as great commuter links via the M1, A6 and M6, it is the ideal location for everyone from young professionals to growing families alike. Barratt Homes prides itself on creating exceptional homes in the finest locations and recently achieved the maximum five star housebuilder rating in a customer satisfaction survey conducted by the Home Builders Federation. For more information about Barratt Homes’ developments, phone 01604 419621 or log onto the website at www.barratthomes.co.uk.